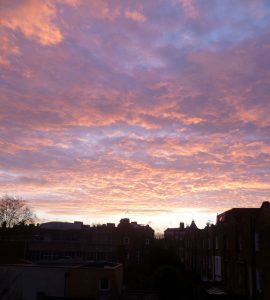 For some reason, I often get wonderful views of sunrises and sunsets at this time of year from either my study – looking east, or from my bedroom window – looking west. 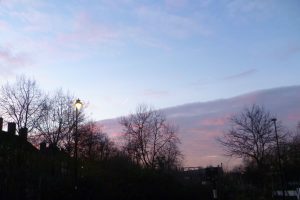 I have only a few moments to catch the dawn before it fades, so I’ve taken to having my camera to hand when I get up, just in case. It probably helps that I live on top of a hill so, on a clear day, I can see for miles. Yesterday, after a run of freezing and miserable days, the sky suddenly lightened and we had a few hours of blue skies and sunshine. And it’s amazing how different everything looks. 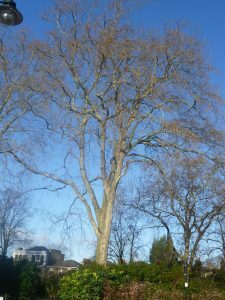 The magnificent plane tree at the end of my road, which must be nearly two hundred years old and more or less contemporary with my house, is strutting its stuff. 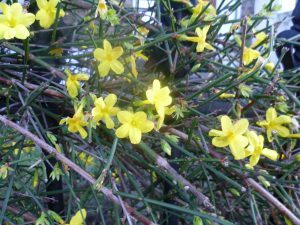 I live in a terrace house, and one of my neighbours has a lovely winter jasmine hedge which is kept closely trimmed, and its flowers sparkle like stars. They are at their peak just now. I wish I could trim my jasmine to look like that. It’s obviously a knack but, alas, I don’t have it. My jasmine flowers are of the waterfall type – pretty enough, but. Over the road there is an avenue of limes. Their real moment of glory is in spring when the lime blossom comes out and fills the air with an intoxicating limy scent. Bees gorge themselves on the nectar and sometimes lie beneath the trees in a sort of ecstatic stupor. In winter, lime trees can look dull but, when the sun shines, suddenly that changes. 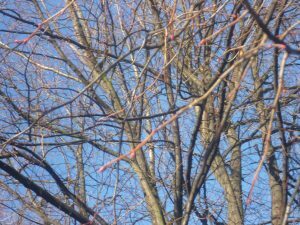 The twigs turn a beautiful pinky-red in the sun and glow. If I’m lucky – and, for some reason, beautiful sunsets seems less frequent – the western horizon can also be a spectacular sight when the sun goes down. This January, I managed to catch both sunrises and sunsets, so I can offer you a glimpse of both. I loved the pink and violet bank of cloud coming up like a blanket in the photo above. All the same, I’m looking forward to spring. Thank you, Prem. May the trees around you be beautifully berried! Thank you, Elizabeth. I think I’m lucky to be so high up that I can see over the roofs and get to photograph the sunrises and sunsets.